Discovered by Edward Barnard in 1885, the California nebula is a large and relatively close nebula in the Orion Arm of our Galaxy. The nebula glows because of the radiation from the intensely hot, class O star, Xi Persei which is the brightest star in this picture. There is only one bright nebula in this region and that is the California nebula itself. It extends across 100 light years of space. Column 1: The standard catalogue name for the nebula. Column 2: Right Ascension and Declination for epoch 2000. Column 3: Galactic Longitude (l) and Latitude (b). Column 4: Angular size of the nebula in arcminutes. Column 5: Nebula type: E = emission, R = reflection. Column 6: Approximate distance to the nebula. Column 7: Approximate size of the nebula in light years. Column 8: Alternative name of the nebula. Below is a map of the California nebula which stretches across four degrees of the sky. Many dark nebulae are also known to exist in this region, so the California nebula is probably only the brightest part of an extensive dark cloud. 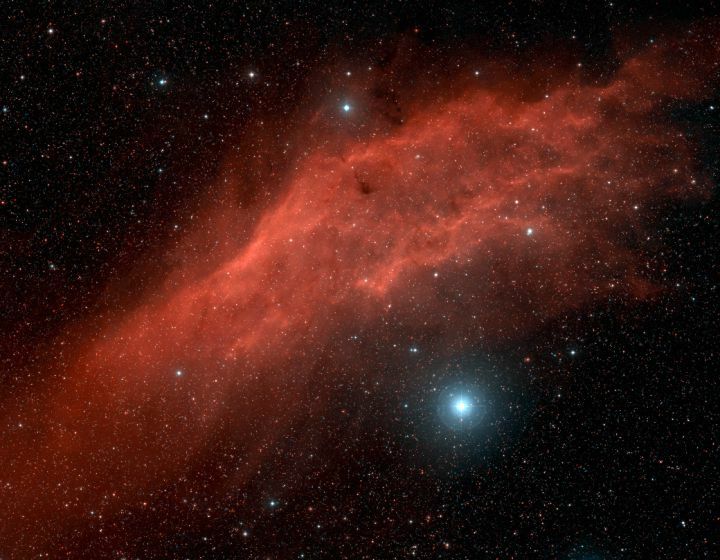 The distance to the California nebula is not known very precisely, although it definitely lies within the Orion Arm and most estimates place the nebula about 1500 light years away. The most accurate distance to Xi Persei from the Hipparcos Catalogue puts the star roughly 1800 light years away, although it could easily be 500 light years nearer or further.